Sarah Ellis keeps a record dish filled with candy at her office in Smith Hall. Ellis encourages students and staff to reuse items for new purposes as much as they can. Photo by Kacy Standohar/The Jambar. 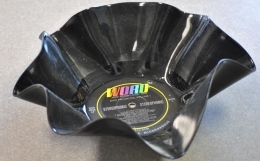 Members of the Mahoning Valley Green Team are turning music into art by selling candy and potato chip dishes made from vinyl records and eight-track tapes. Kristine Shoemaker, a Mahoning County Solid Waste Management policy committee member, warmed the records in the oven at 200 degrees and then dropped them in a four-inch flowerpot to form the bowl shape. Shoemaker said the records were scratched and weren’t usable or recyclable. “I just decided it would be a good idea because we like to prevent things from being thrown away,” she said. Shoemaker said she found the idea online and was excited to find a use for the albums. After making about 300 record bowls, Shoemaker sold some and gave them away as gifts. “They were really cute and not hard to make,” she said. Shoemaker added that sites like Pinterest are ways to find great ideas to turn your trash into treasure. “The whole idea is to use, reuse and again until you can’t anymore,” Shoemaker said. Re:CREATE is a free program of reuse initiatives where students, faculty, staff, industries and companies can exchange materials when needed for new purposes. Sarah Ellis, manager of YSU’s re:CREATE, said reusing and recreating items is important because it teaches students to start and improve recycling programs at their businesses or in their communities. “We aren’t just recycling here at YSU; we are showing students what is possible and fostering a commitment to recycling and reusing,” Ellis said. Ellis works closely with the Green Team to supply items in educational craft programs. She said reusing nonrecyclables saves limited landfill space and natural resources. It also cuts down on the pollution level when making new material. “It’s my belief that if we all just shared what we didn’t need instead of throwing it away, we’d have enough to go around,” Ellis said. The Mahoning County Commissioners’ Reuse and Recycling Division and the Green Team funded YSU’s re:CREATE. Ellis said the re:CREATE office space is open for all YSU students to use every Saturday from 9 a.m. to 4 p.m. in the Habitat for Humanity ReStore at 480 Youngstown Poland Road.